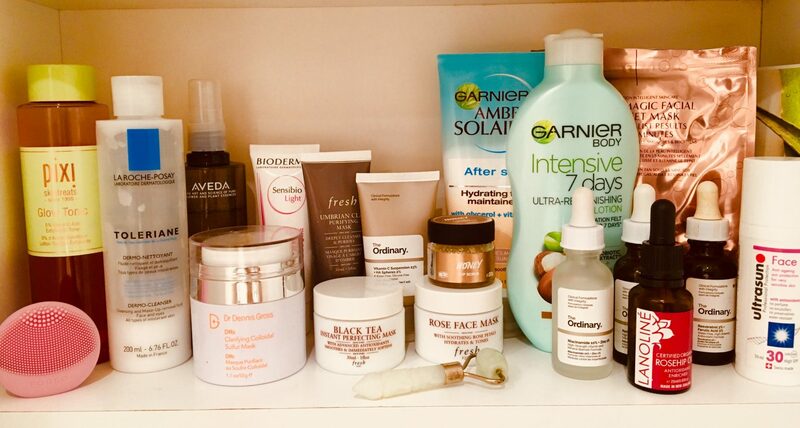 There’s nothing like a new season to make me want to overhaul my wardrobe as well as my bathroom cupboard (when I say bathroom cupboard, I also mean all the other boxes of skincare I have around my flat). Only the ‘things I use every day’ and ‘body’ category got to stay in the bathroom cupboard. My logic around this is that I use treatments and masks when I actually want/need to. Having everything in the bathroom cupboard means there’s less consistency in my routine and it’s a bit all over the place. So what made it into the ‘things I use every day’ category? For some this may seem a lot, but this is what I use morning and evening. ‘Travel’ is all the sub-100ml products I have and anything related to holidays and sun. This is shampoo/conditioner, dry shampoo, deodorant, micellar water etc. It also includes self-tanning products and sun creams and the varying collection of wash bags. These are topped up from hotel stays and are easy to reach whether you’re going to the gym, staying over somewhere for a night or a full blown trip away. ‘Masks’ are as the name suggests all my masks: Dr Dennis Gross, Fresh, Caudalie, Zelens, Embryolisse, eye masks and other one-use sachets. By having these stored separately I only reach for them 1-2 a week. I’m pretty loyal to the La Roche Posay Toleriane Dermo Cleanser but I do keep other cleansers if my skin feels like it needs something different. So in the ‘cleansers’ category there’s: Bioderma Crealine Lait, DHC oil, Dermalogica pre-cleanse balm, Philosophy Purity. Finally ‘treatments’. These are all the liquid and physical exfoliants that don’t need to be used on a daily basis (nor should they be) as well as additional retinols, samples of serums I haven’t opened and oils.